The SeaPort-e contract is an indefinite delivery, indefinite quantity (IDIQ) vehicle established to facilitate a Navy-wide electronic procurement process that leverages buying power, improves business intelligence, and reduces purchasing time. SeaPort-e has a two year base period with possible extensions for seven additional years. The government anticipates procuring a maximum of $5.3 Billion in services per year using the SeaPort-e vehicle. The SeaPort-e supports all commands within the Naval Enterprise including the Naval Sea Systems Command, Naval Air Systems Command, Space and Naval Warfare Systems Command, Naval Supply Systems Command, Military Sealift Command, Naval Facilities Command, Strategic Systems Programs, the United States Marine Corps, as well as other Department of Defense agencies. Yakshna Solutions Inc. (YSI) has developed a team of highly skilled and experienced companies with a proven record of providing government customers efficient, effective, and cost-appropriate solutions. The U.S. Navy’s SeaPort-e Program selected YSI’s team based on their long history and significant credentials successfully supporting government customers. YSI’s expertise in Quality Assurance is the result of a comprehensive set of standard procedures developed, reviewed, honed, and tested over 5 years of organizational experience supporting numerous projects to support federal, state and industry leading corporate clients. To ensure a consistent approach and delivery, YSI uses a Project Management Office (PMO) concept as the foundation for our Plan, Do, Study, Act – Cycle of Quality Assurance (QA). These two process frameworks ensure that requirements meet expected quality levels and costs are controlled whether the task order (TO) is in a single region and composed of only one discipline or when tasking requires multiple zones and disciplines. The figurebelow provides a high level overview of the YSI’s QA Process. The PMO process provides the foundational structure with which YSI successfully delivers on all Quality Assurance (QA) initiatives. This disciplined approach provides a framework for using tools, team structure, and processes in a manner that is responsive to systematic improvement. 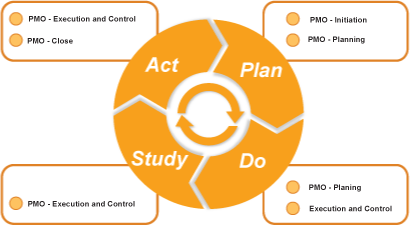 Plan, Do, Study, ACT (PDSA) Cycle of Quality Assurance Framework YSI’s QA method utilizes the PDSA Cycle to logically manage QA initiatives with a consistent, repetitive, and optimizedmethodology/process. This disciplined approach provides a framework for a collaborative alignment and engagement of tools, team structure, and process designto ensure the highest quality outcomes and performance levels. In the initial phases of a project, YSI will develop, in coordination with our clients’ staff a quality management plan tailored to the scope of work. We will examine the scope of work and define end-to-end performance measures and goals. Do: QA Checks. The YSI team, including subcontractors, vendors, and consultants, execute the Quality Assurance Project Plan. As deliverables are produced and milestones met, the YSI staff develops comprehensive reporting artifacts to memorialize progress as defined by the PMO standard operating procedures. During project tasks, support staff cross-check and validate all YSI teamwork to ensure highest quality performance on tasks needing absolute accuracy, with supervisors adding an additional layer of review, oversight, and quality checklists to ensure work deliverables meet and/or exceed project requirements and standards. Study: QA Feedback. After performance on the task is complete, YSI utilizes a variety of tools to quantify each area of the project. Data points are filled into the Quality Assurance Plan and compared to the Acceptable Quality Levels or objectives. Surveys are conducted and tallied. The goal is to identify areas of success and failure. Act: QA Enhancement. YSI’s emphasis on feedback and evaluation has led to an accumulation of lessons learned that is shared across the organization in training programs, policies, and procedures. Comprehensive focus on customer satisfaction fosters corporate culture of continuous improvement and excellence, with constantly reinvention/evaluation of best practices to optimize products/services and better serve clients, organization missions, and related initiatives. The ultimate key to process improvement is the consistent and programmatic integration of lessons learned back into everyday performance. This phase is the closing of the feedback loop, where conclusions feed into future planning phases.